The new cycle represented by a New Moon is here tamped down somewhat by the approaching Mars-Saturn conjunction @17Virgo (at 3:30 pm edt), a critical degree where rioting, protesting Uranus-Pluto met in Great Conjunction/s in the mid-1960s, denoting delays of a stop-and-go nature. Serious conditions abound and even the New Moon is in a serious sign (Mercury-ruled Virgo) in the 11th house of Group Associations/Hopes and Wishes. 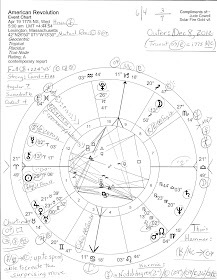 There are 2nd house indications of financial hindrances in evidence while chart-ruler Venus (ASC 16Lib03) applies in aspect twice--first to warrior Mars (0A13), then to austere and delaying Saturn (1A22). Caution is exercised in financial matters and my suspicion is that this all relates to a new cycle in America's warring interventions in the Middle East--Iraq in particular. Shady or secretive events may transpire over the weekend during the Dark of the Moon, the three days prior to a New Moon. Perhaps US attempts to sign up allies in the struggle are being shut down or at least hindered by financial and/or political concerns domestically and abroad plus, there's the common view of our 2003 misadventure in Iraq as being a 'bottomless pit in the money department' which was this astrologer's opinion of the Iraq War in March 2003 due to Jupiter the General's retrograde condition at its start--never go to war with Jupiter Rx, even fools know that! But neocon fools had to rush in, didn't they? Then there are the so-called Christian military types who demand a rush toward Armageddon, remember. And now it seems that the Islamic State, (aka, IS, ISIS or ISIL), a band of assassins infecting Iraq, agree. In Astrology there are two bodies, one a hypothetical, called 'Isis' and on August 25, 2014 they are both located in Tropical Cancer, one @25Can21 (conjunct US natal Mercury Rx--"ISIS" in the Mercurial news) and the hypothetical Isis @18Can21--conjunct the Midheaven of this New Moon chart! The MC is, of course, the Aspiration/Goal Point of any chart--the Why? Point. In this post I won't go into the Isis archetype of the feminine goddess which is worship in veiled form in America from our founding and can be seen in the Venusian Statue of Liberty, dovish Columbia statues and titles (District of Columbia), and other symbols of feminine idols across the nation, usually seen via statuary and in official mottoes. However, our peaceful 'dove' archetype has been morphed into "...an Eagle" if we look to the Sabian Symbol for '26Libra.' One watershed moment when this occurred was the Bush-Cheney switch of the military to preemptive war which America was never supposed to wage against other nations. At least, America's founders didn't plan our nation that way and this to my dissenting mind is the same thing as a coup d'etat of the US government. The transiting midpoint picture of Saturn-Neptune = Pluto continues to affect society in negative fashion as many folks are feeling downtrodden while others in charge are busy denying their guilt. Added in the New Moon chart thanks to the Mars-Saturn conjunction are the potentials of this picture--Mars-Neptune = Pluto: dreams of violence (Ebertin.) And this picture hints at America's problematic Mars-Neptune square from July 4, 1776 with its deceptive or misguided actions quality and 'fog of war' implications. I would say, Here we go again--but we never left. 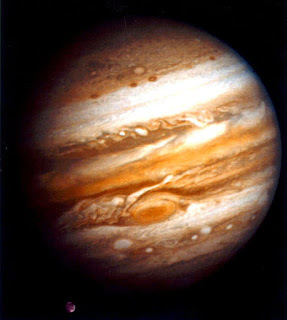 Venus squaring Mars indicates a competitive atmosphere in force where our government and others are engaged in battle. Enough energy is on hand to accomplish the task as long as over-reaction to insults and and taking revenge are avoided--maturity is needed which hopefully a cautious #POTUS may provide to override our usual hotheads. 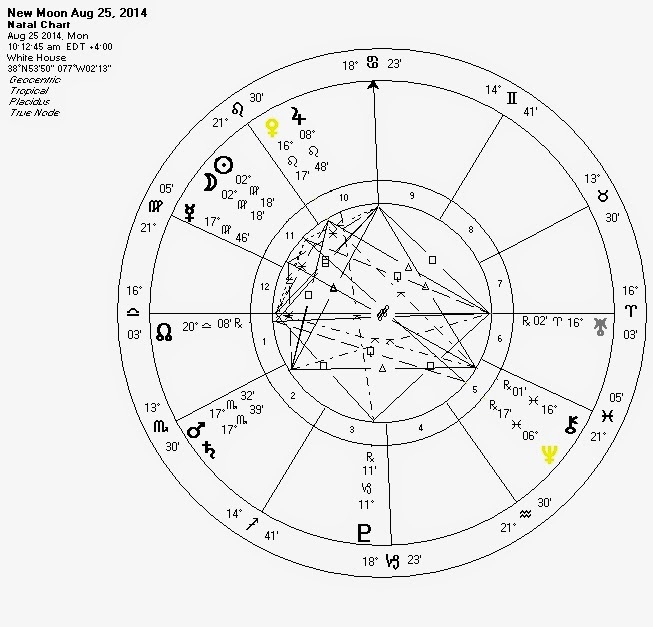 One word about current US Progressions when the chart is set for our natal location of Philadelphia, PA: our SP Ascendant is @2Vir08 with the August 25, 2014 conjoining it, a condition which for me personalizes the New Moon for current conditions in the United States of America. Our SP Mars Rx (militarized police forces at home--US Mars turned retrograde by Progression in 2006, the year that the Pentagon began supplying local police departments with military equipment and weapons) is being opposed by our SP Chiron @17Ari26 (in SP 8th house) denotes a full flowering of the sacred warrior archetype in the US psyche. As you see, this opposition is yet to perfect with SP Mar symbolically moving toward lower degrees of Aries and SP Chiron (the Quest) moving toward the upper degrees of Mars-ruled Aries. And of course the Aries-Libra axis is one of war and contention though diplomacy must be fitted in there somewhere. Another factor of great importance in the SP Mars-Chiron opposition is that this is a 'fight injustice' aspect with enormous compassion shown for the oppressed--we hear of such issues each day in the news and experience them in our lives for it's oppressive Plutocracy v The People! The killing of unarmed Michael Brown in Ferguson, Missouri comes to mind along with our worsening income inequality. A Standing Army and Foreign Wars Our Nation's Waterloo? Yet the point really is that resolution can only be found on the spiritual level (Chiron) for our Mars-Chiron opposition actually signifies a deeply spiritual condition and on that plane is where true resolution is to be found. Yes, lack of money to fight wars may be our saving grace after all! 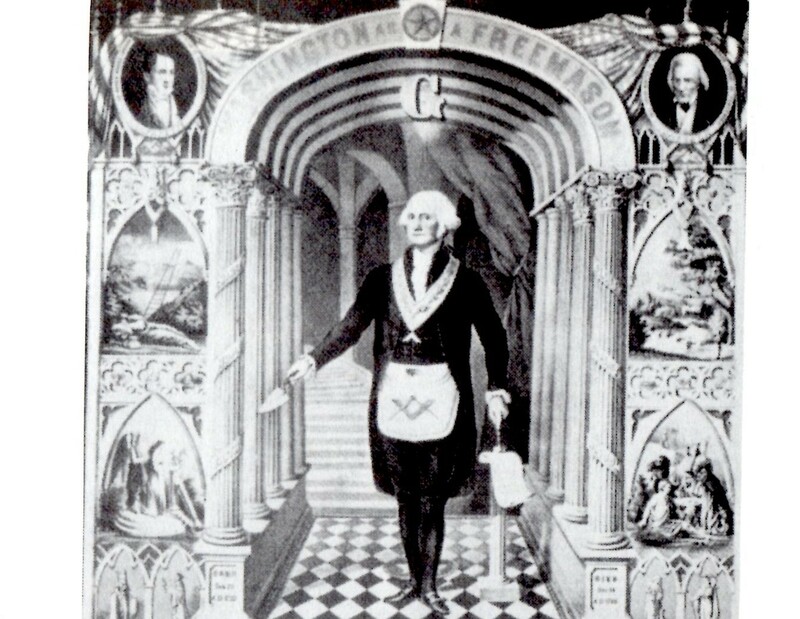 For casting aside the dreams and visions of Armageddon promoters, We the People must come to a spiritual resolution for ourselves for who can imagine spiritual improvements or benefits coming from the direction of corrupted Washington DC and the political tricksters and financial fraudsters who have overtaken and infest our capital and have hijacked the very destiny of the United States of America? 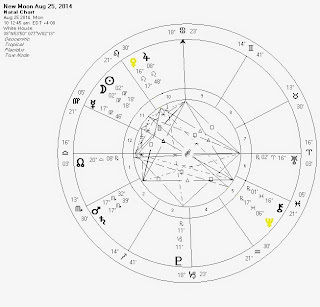 US Progressed chart issues from US natal horoscope of July 4, 1776 5:10 pm LMT Philadelphia, PA; SP chart remains set for natal location.